Some time ago, my dearest friend A. brought me a big piece of fabric left from the curtains of her granddaughters' bedroom. With it I sewed two little quilts and chose matching fabrics for the binding. I prepared and sewed the binding this morning. 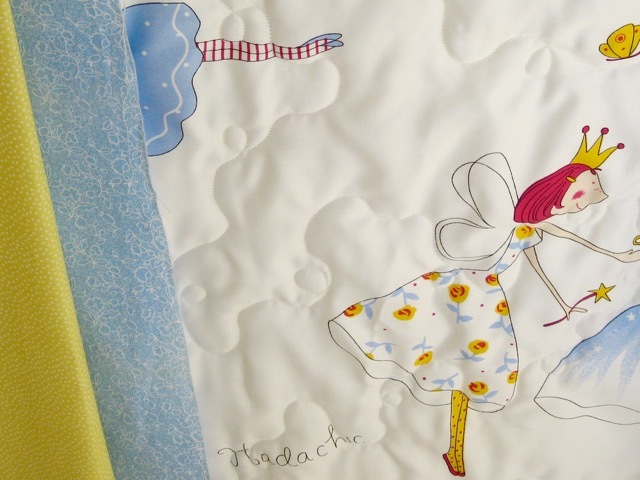 I find the finished quilts very fresh and cute and I think the little twins' bedroom will be lovely. 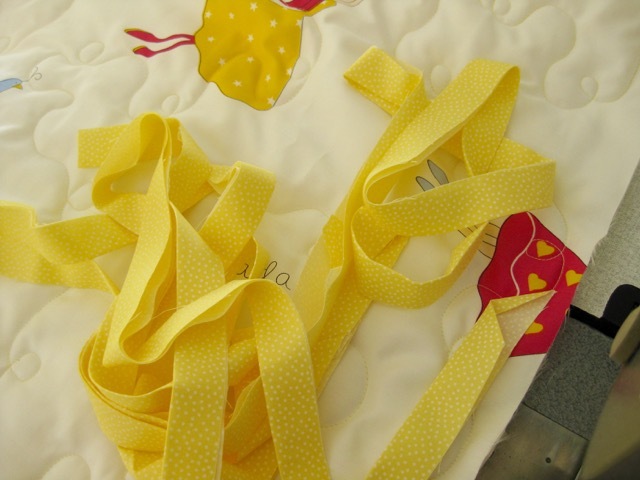 You can find here my binding tutorial. Cute! Was this home dec fabric? Yes, it was a home deco fabric. What an artist you are, Christine! These quilts are so fresh and bright. 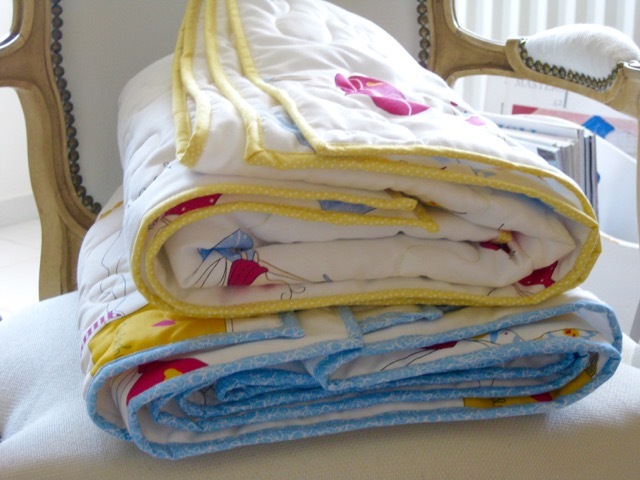 Two delightful baby quilts - lucky little ones! May you enjoy a very Happy, Safe and Peaceful Christmas. Those quilts are fresh and delightful! I still remember the ballerinas on my bedroom wallpaper as a child. I think the twins will remember these characters too. 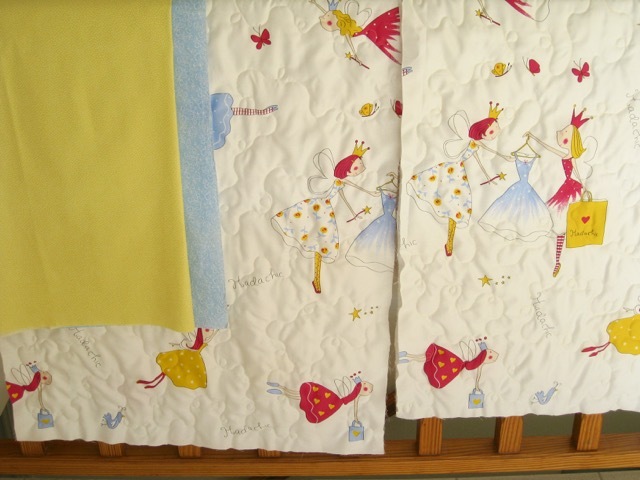 Same fabric, but different binding is a perfect way for the twins to have similar, but identifiable quilts. Le tissu est vraiment mignon et couper dedans aurait été dommage! Et rien qu'en choisissant deux couleurs de biais différentes, les quilts sont différents. C'est la magie de le vie des couleurs! Belle journée! Christine, I love your blog and always look forward to seeing the beautiful things that you are making. I really love this fabric and was hoping that you would share the name of it so that I may look for it. Hope you have a wonderful holiday. Thank you Maureen for your kind words! My friend bought this fabric here in Athens. I will ask her if she ever knew the name of it. (You are no-reply blogger and I cannot reply to you personally). The fabric brand is Foundoulisfabrics. Such sweet fabric. Nice quilting (and binding!) Christine. 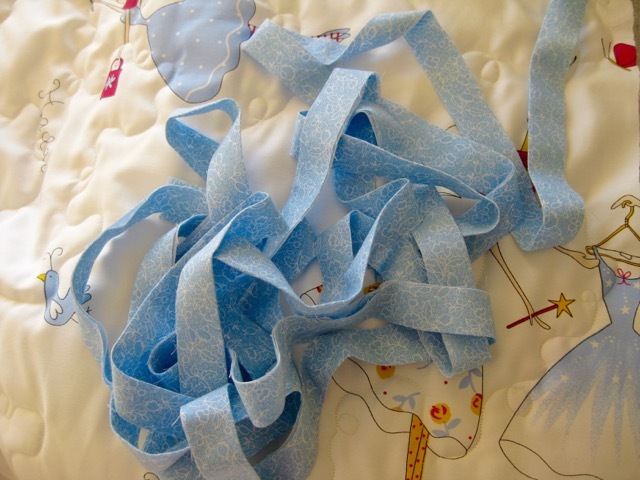 That is wonderful fabric, and the fresh quilting and binding are perfect. Great idea, Christine, and happy Christmas! Très très joli quilt . Bonne année.